Ruff! Ruff! Hello, my fluffy pack! A while ago, Buff wrote a post called how to get away with anything. Think of how to be a dog and get away with it, as the sequel. Dogs are not the typical animal. Unlike other animals, we consist of magic. Yep! You heard me right. Because of our magical abilities, there are things that we can do that might seem wrong, but it's really not. As always I've made a list of these so-called wrong right things. I love to nibble on Renza's hands and feet. What?! I lick it better afterward! She's not even upset. Let's just call it "play biting" because it sounds better than biting, although it's the same thing. But say another animal like a bear or our ancestor the wolf starts nibbling on a human, it's wrong on so many levels. There might be some screaming involved and some chasing too. It normally ends badly. When I chase mommy she'll scream and laugh at the same time. I try to get her good, but it's not as effective because I'm so cute. I also bite visitors feet and they just laugh or have low fear responses. It's impossible to be taken seriously as a hunter around here. I guess that's what happens if you're a fluffy magic dog. Unfortunately, if a doggie was raised to be grumpy, then you will have to scream and run. No laughing required. Like our neighbor who is void of any magic juice. A lot of doggies get away with this one. In fact, they have successfully convinced their humans that it's ok to share chairs and beds. We're not allowed to sleep on mommy's bed although I've tried to make myself comfy on there several times. She says I shed too much. I think she's just lazy to vacuum! We're allowed on the covered chairs that I chewed on a bit or uhm a lot. 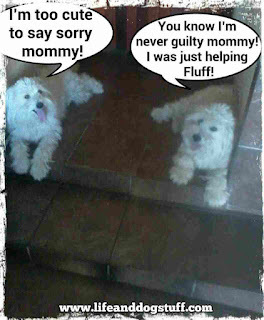 Otherwise, we have our own dog beds that I destroyed and mommy fixed a million times already. What?! She loves fixing stuff! There are some lucky dogs out there that can sit and sleep on anything. There's dog hair everywhere, but it's okay. Dogs are too cute for it to be wrong. That's why vacuums were invented right? Vacuum or eat hair human! Ripping things apart is what us doggies are notorious for. I refuse to apologize or feel guilty for doing something that's so much fun. Sorry is for the weak! I've already destroyed tons of mommy's stuff. Don't worry, it's ok. Sure you might see steam coming out of her ears and she'll yell a bit and I'll yell back, but that's it. If a crazy family member destroyed something then that relationship is toast. If I do it, I get head scratches 20 minutes later with a lengthy apology. Yep! She's the one that says sorry. 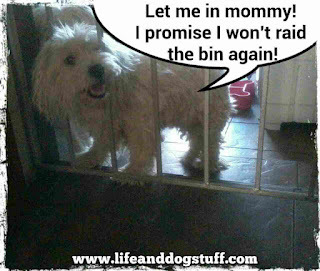 Bin raiding is a skill that Buffy has not taught me yet. I have to say I'm impressed by his sneakiness and stealth. If a raccoon raided a bin then it's wrong. But because it's a cute fluffy dog with magic eyes, it's not wrong. Not because he's not naughty. Oh, believe me when I tell you he does a lot of 'wrong' things. He's just that good. Buffy is yell-proof. 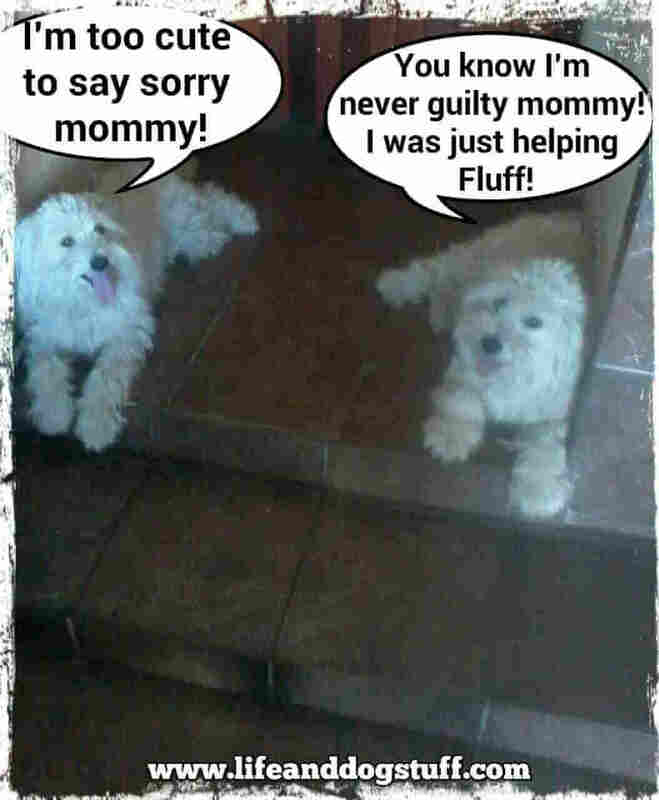 For as long as I've lived here with mommy, Buff has never been yelled at. I still get yelled at though. It's ok. Like I mentioned earlier, I always win an argument and get rewarded with cuddles afterward. Yep! I'm that good! We, unfortunately, live in a house that always gets visitors. Always! When are we escaping Renza?! Geez! Because the oldest people in the family live here, it's the hub and they have loads of church friends and know everyone. Buffy and I are in charge of security around here, so we can't just look the other way. Buff hates long coats and pulls on them from behind. They must be hiding something! I do my special fluffy dance for them to apologize for Buffy's coat pulling. 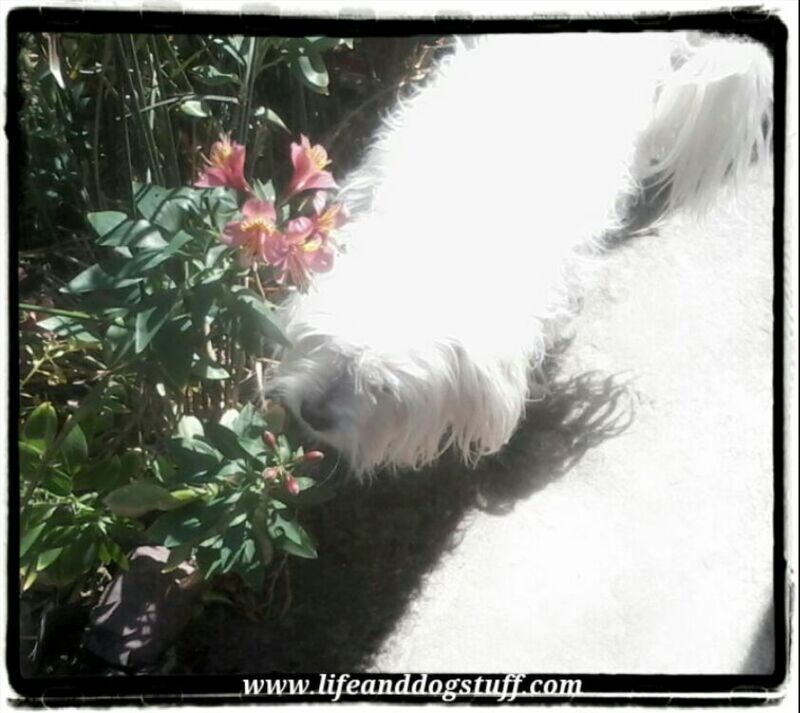 A little feet nibbling gets thrown in there too because mommy loves it and they get a special greeting bark from me. Apparently, some visitors prefer less interaction. Oh please! We live here and you don't! Security checks are a must. Don't worry! Renza does not care how we greet people. We are her babas and the visitors should make more effort to make friends with us. We've made a lot of human friends that visit, but we do get the occasional wimpy humans that's scared of dogs. Go grow a pair! This is a skill that Snowy has mastered. Buffy marked his territory before he was neutered and I occasionally had a few watering accidents. We have since moved on to designated areas. Snowy has not. He stayed with us for 6 months and made sure everything smelled like him. Everything! He even attempted to water me. Yep! I was almost marked. Mommy thought it was funny. The nerve! He's very naughty, but because he's a dog with magical abilities he could just do whatever he wanted to. Marking another dog's territory is the wrongest wrong of all the wrongs. But Renza's Snow-snow is too cute to be guilty. We can still smell him! I'm an expert noise maker. It's just something that comes naturally to me. I howl, I bark, I don't care. If the neighbors played loud music in the middle of the night, then the police would probably be called for noise disturbance. 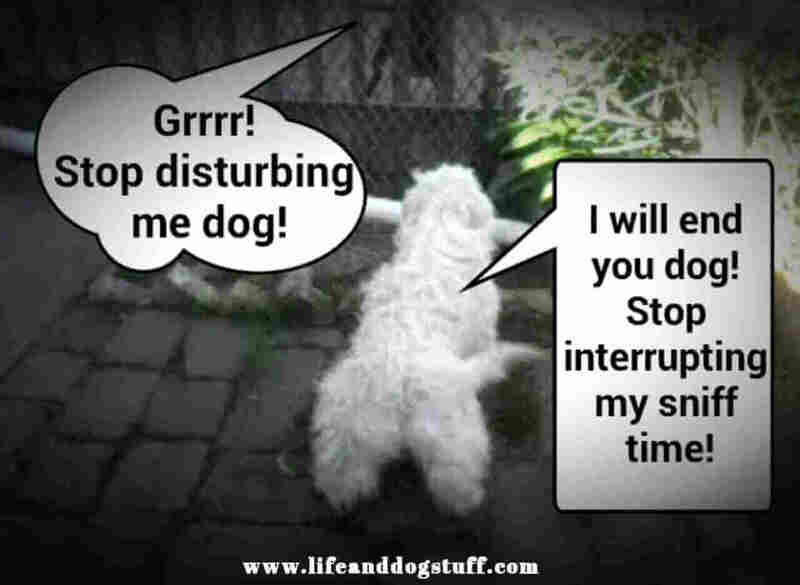 Us doggies can have barkoffs 2 to 3 times a week and it's just background noise. There's no need to notify anyone because all the dogs are barking simultaneously. There's no clear culprit to blame. Nope! I plead innocent. You have no proof! Argoooooof!! 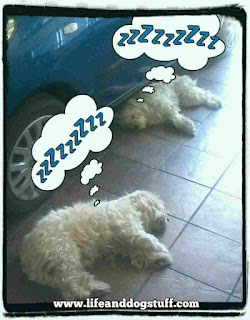 There you go, my fluffy pack. Now you have undeniable proof that dogs are magic. We can get away with anything because we're the best. Don't worry! Unlike unicorns, we don't have a murder weapon attached to our heads and we're actually real. What?! Got to go now! I smell bones in the bin that we're not supposed to have but really, really want. 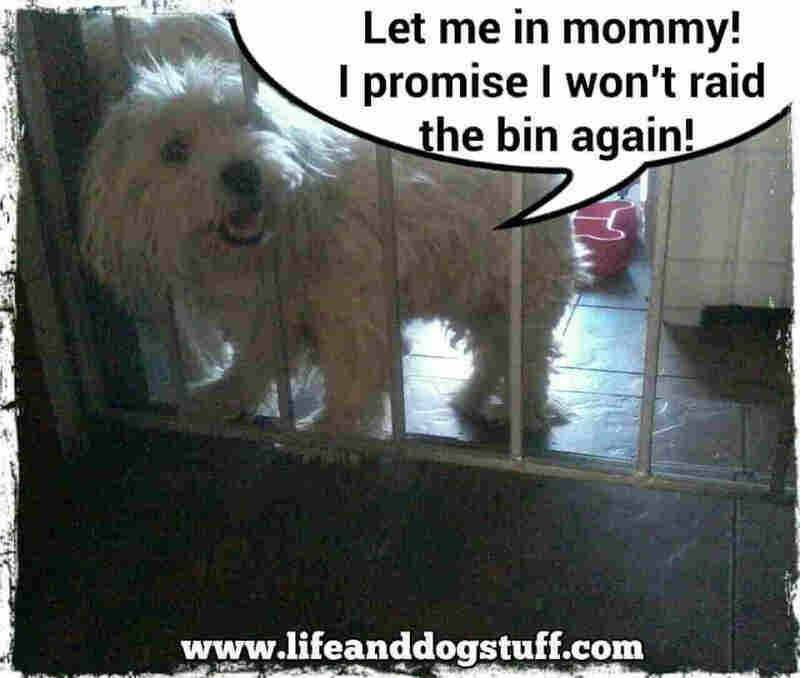 Let me go tell Buff to tip the bin over while I distract the humans. Shhhh! Never miss a blog post by Joining the fluffy pack for updates you guys. 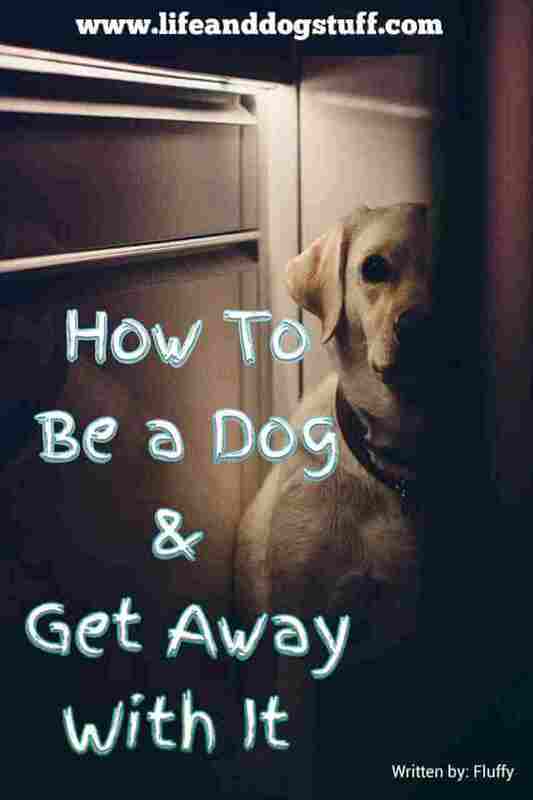 Please share if you think your friends will enjoy reading my How to Be a Dog and Get Away With It post. Thank you! Ruff!